Dr.Winston Vargheese, Lecturer in Sarada Krishna Homoeopathy Medical College, Kulasekaram is a leading academician and research scholar. His contributions reflected to the community as scientific papers in seminars and articles in journals. He has organized many seminars and known for excellence in the field. A 67 years old male presented with painful ulcer in the left foot since 3 months. Pain aggravated in night. He has also got numbness of the lower extremities especially at night. This gets worsened while walking and lying on sides. Patient is known diabetic since 3 yrs. Three months before he got injured on left little toe and took some herbal external application, but his condition worsened and went to allopathic hospital near by to his house where the toe was amputated. 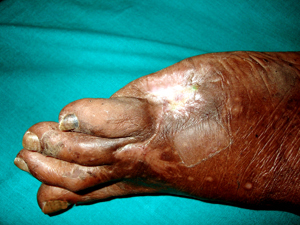 Then the patient developed gangrene over the amputated site and referred to Chennai hospital where it was diagnosed as vascular obstruction and advised to undergo vascular surgery which requires nearly eight hours of anaesthesia. Ulcer 13cm x12 cm, Floor with slough and gangrenous matter, base of Meta tarsal bone. Done on 25-01-08 of lower limb reveal that severe atherosclerotic peripheral vascular occlusive disease (diffuse irregular, intimal thickening, fibro fatty plaques, calcified plaques, focal arterial wall calcification, atherosclerotic changes) involving the entire left lower limb arterial system. Left deep femoral artery and geniculate arteries show diversion of flow causing little collateral flow around the knee joint. Distal arteries (left popliteal, proximal anterior tibial and peroneal arteries) show compromised high diastolic continuous low velocity biphasic flow. 3. Aortic bifurcation, both sides common iliac, internal iliac, and external iliac appear normal. Common femoral arteries appear normal. Complete occlusion of superficial femoral artery seen immediately after profunda femoris with distal flow formed by muscular and profunda femoris collaterals. Length of occluded segment measuring 20cm. Anterior tibial artery appears normal. Tibio peroneal trunk and peroneal artery show mild diffuse disease. Significant diffuse disease of posterior tibial artery seen with distal flow formed by collaterals. Impression: The above findings are suggestive of peripheral femoral popliteal vaso occlusive disease. Dry Gangrene with Peripheral Vaso Occlusive Disease and Diabetes Mellitus. Finally Ars alb was selected and treatment started with Ars alb 0/3 QDS. Then the potency was raised to 0\6 and 0\12. 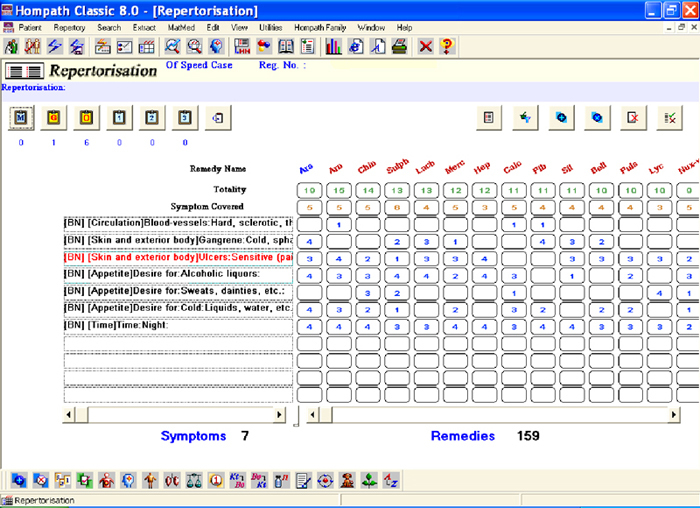 Over a period of six months patient showed improvement in ulcer and diabetes. The diet was modified in such a manner that the patient is asked to consume lot of fresh vegetable salads and sprouted materials. As the patient was already on insulin, it was allowed to be continued after strict monitoring of urine sugar. Patient was admitted in the IP for a period of three months. The wound was dressed with calendula glycerine twice. The case has presented with very advanced pathological changes and so there was lack of characteristic symptoms which has forced us to select the pathological symptoms for prescription. As the pathology was very prominent the Boger Boenninghausen Characteristic Repertory was used for repertorization. Since we are dealing with very advanced pathology we felt the need of a safe potency so 50 Millesimal Potency was used which has also allowed frequent repetition of doses. During the course of treatment after a month the patient was seen by a surgeon who has nibbled the metatarsal bone which has allowed the growth of granulation tissue. While the patient was under the surgeons care he was given a course of antibiotics by him. The surgeon was astonished over the bleeding while nibbling the bone and while referring back he has marked that the vascularity is adequate.